Brickyard weekend has stretched into five fantastic days of racing action with the addition of the Driven2SaveLives BC39 powered by NOS Energy Drink on Wednesday, Sept. 4 and Thursday, Sept. 5 at The Dirt Track at IMS, the quarter-mile clay oval inside Turn 3. 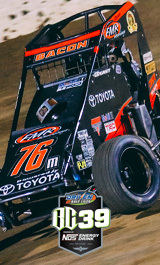 The best short-track racers in America will compete in the richest USAC Midget National Championship race. You won’t want to miss either night of dirt-track racing at the Racing Capital of the World.